Origin: Granted in 1761, the town was named for Hanover Parish, the home parish of settlers from Lisbon, Connecticut. In 1769, Reverend Eleazar Wheelock, received a charter for a college to educate Native Americans, an expansion of the Charity School he had established in Connecticut. The college was named for William Legge, Second Earl of Dartmouth, a supporter of the Reverend's efforts. In 1771, Governor John Wentworth, upon petition from Reverend Wheelock, chartered 300 acres between Hanover and Lebanon for Dartmouth College. The land chartered to the college was for a time known as Dresden, one of 16 towns involved in a border dispute with Vermont. 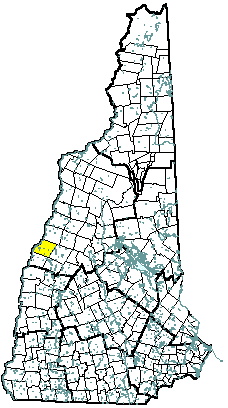 Today, the name Dresden is that of the local school district, a bi-state district including towns from both sides of the Connecticut River. Population Trends: Population change for Hanover, including resident students, totaled 3,881 over 52 years, from 7,329 in 1960 to 11,210 in 2012. The largest decennial percent change was an 18 percent increase between 1990 and 2000. The 2012 Census estimate for Hanover was 11,210 residents, which ranked 27th among New Hampshire's incorporated cities and towns. Population Density and Land Area, 2010 (US Census Bureau): 229.7 persons per square mile of land area. Hanover contains 49.0 square miles of land area and 1.3 square miles of inland water area.